Medium:Serigraph on Paper in 40 colours. Edition of 125. >Born in 1939 in Ahmedabad, Gujarat, Manu Parekh has completed his Diploma in Drawing and Painting from the Sir J.J. School of Art, Mumbai, in 1962. His early work explored the relationships between man and nature, as according to him, this was an energetic link that had to be celebrated. The artist also points out that, since then, contradictions have formed the basis of his artistic practice, no matter the subject or genre of his works. Supported himself by acting on stage in Bombay.Worked as a stage designer in Ahmedabad. Joined Weaver’s Service Centre, Bombay,as an Art Designer, 1963. Design Consultant for Handicraft and Handloom Export Corporation of India in Culcutta, 1965-74 and in Delhi, 1974-1989. Banaras as a city came to play an integral role in his work after his first visit there following his father’s death. This holy city of hope, of faith, of tourists offered him a vast number of contradictions in one location. Parekh also highlights his relationship with his wife Madhvi, who is a self taught artist, and his admiration for Picasso as key influences on his works. Parekh held his first solo exhibition of graphics and paintings in Ahmedabad in 1968, and has not looked back since. 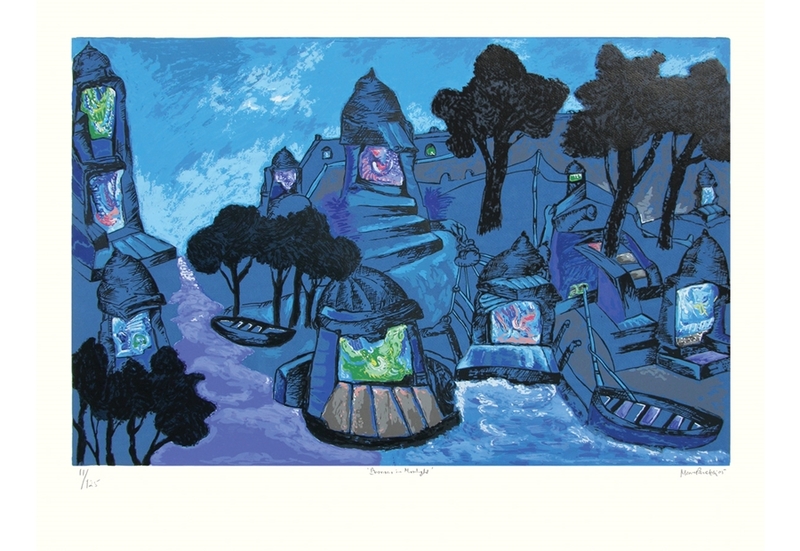 His most recent solo shows have included ‘Banaras – Eternity Watches Time’ presented by Saffronart and Berkeley Square Gallery, London, at Jehangir Art Gallery, Mumbai, in 2007; 'Banaras' at Vadehra Art Gallery, New Delhi, in 2004; 'Portraits of Flower and Landscapes of River' at Jehangir Art Gallery and Tao Art Gallery, Mumbai, in 2003; 'Ritual Oblations' at Rabindra Bhavan, New Delhi, Sakshi Gallery, Bangalore, and Sakshi Gallery and Jehangir Art Gallery, Mumbai, in 1999; and 'Small Drawings' at Sophia Duchesne Art Gallery, Mumbai, in 1991. Parekh has also had solo shows at Bose Pacia Modern in New York and at ARKS Gallery in London. He was awarded the President of India's Silver Plaque and the All India Fine Arts and Crafts Society Award, New Delhi, in 1972; the National Award from the Lalit Kala Academy, New Delhi, in 1982; and the Padma Shree from the Government of India in 1992. He lives and works in New Delhi. .